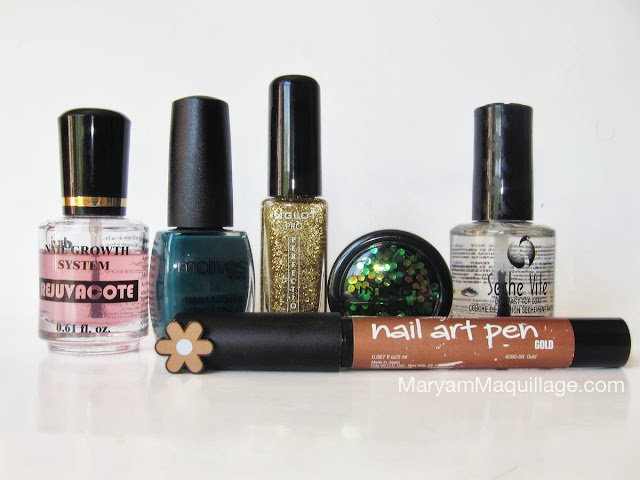 Maryam Maquillage: "Dazzling Anaconda" Snake-Skin Nail Art! "Dazzling Anaconda" Snake-Skin Nail Art! Hello my darlings!! It's been a while since my last hand-designed nail art and I feel terrible about bypassing my favorite topic. Truth is, my nails just haven't been the same since my trip -- I've damaged a lot of them while peeling Southeast Asian fruits like Rambutan and Mangosteen, so I had to let them breathe without polish so that they could grow back healthy. My nails are still quite short, but they're back to normal and I'm excited to present this festive, snake-skin inspired bedazzled nail art, just in time for Mani-Monday! 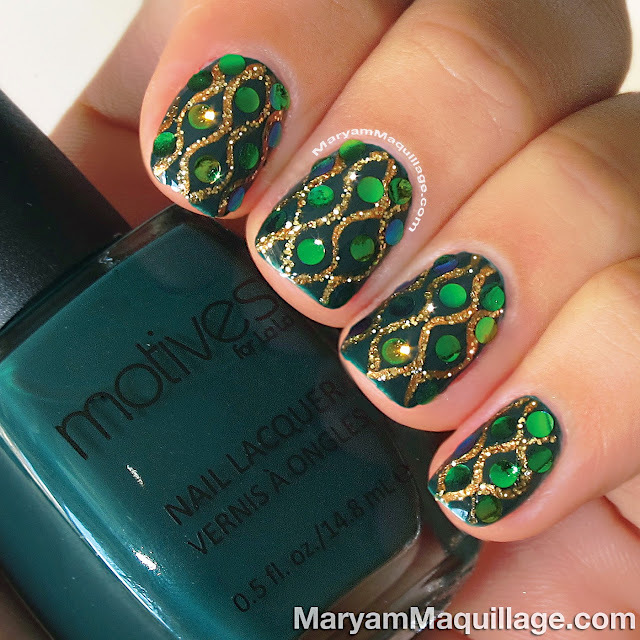 I'm using emerald polish from Motives Cosmetics (yes, Motives even offers polishes!) topped with glitter and spangles from Inglot's latest nail art collection. Read more for tips, pix and how-to! Motives for Lala Nail Nail Lacquer in Jaded -- I almost never wear green, but this color is LOVE! Apply your base coat and follow with two coats of "Jaded" base color. Allow the polish to dry thoroughly. 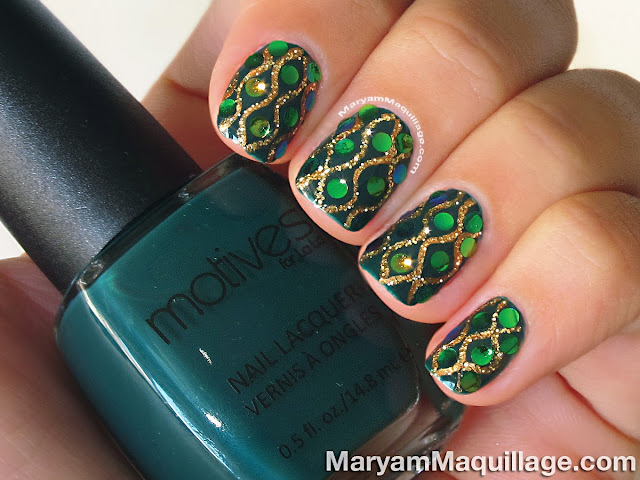 Using a gold nail art pen (any will do) paint vertical wave shapes so that they form a fishnet pattern. This will serve as the base color for the glitter. Apply gold glitter liner on top of the gold wave shapes to make the color pop. Working with one nail at a time, seal the design with clear polish (I used Duri Rejuvacote) -- it also serves as the sticky adhesive for the glitter. Pick up the glitter spangles with a wet toothpick and apply to the hollow areas of the fishnet design. Seal the design with 1-2 coats of Seche Vite Dry Fast Top Coat. I hardly ever wear green, but when I do, I always pair it with hot, vibrant pink! Come back soon to visit my blog, I'll be waiting for you!! " Love this! Those big pieces of glitter look awesome! I'm going to try this one out! "Win a Trip to Paris" Contest Giveaway!